The below merchandise is available for the suggested donation listed. USA orders – $5 shipping. International Orders – add only $10 shipping fee. 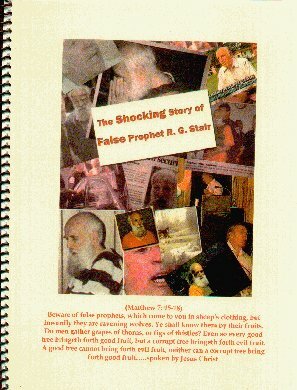 This book was offered on the Sky Angel Christian Dish system that goes into 6.5 million homes! Since Printing this we have been attacked over and over by Stair’s people putting out Trash about this ministry which he knows nothing about! The aftermath was that he was arrested but got probation and was sued for a large amount of money and he lost and is paying an undisclosed amount back. No matter what is said about this ministry or me this truth does not change! The End Time Band.We have uploaded 7 songs from Brother Ben that you can listen to by clicking the links below. A CD with more of these songs is available for a $20 donation. Prophecy Hour Radio ArchivesEach of our archived programs are available on CD for a minimum donation of $5 each and shipping is $5 per CD up to 10 CD’s. After that please just start a new order or add another $5. The CD’s will be sent to you in a format compatible with all CD and DVD players. Be sure to specify which program you are wanting; International shipping is $15.